Themes provide a pre-defined set of colors and fonts which can be used to quickly style in-page experiences. Gallery provides a set of default themes but you can also create your own, custom themes. Any custom themes that are created are shared across a Video Cloud account. Once a theme is applied to an in-page experience, you can then use the styling options to further customize the appearance of the experience. Note: If you have existing themes, it may be quicker to duplicate a theme and then make edits vs. creating a new theme. Edit the experience and then click STYLE in the left navigation. The current theme is displayed at the top of the styling menu. Click on the theme. A list of all the themes will be displayed. Click the Add a custom theme link. Enter a Name for the theme. Edit the styles as appropriate. All changes made to the style settings will be saved automatically. When done, click < Back to Styles. Edit the project and then click STYLE in the left navigation. 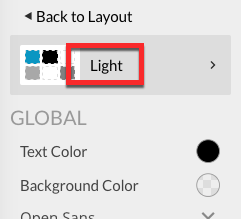 The current theme is displayed at the top of the styling menu. Click on the theme. A list of all the themes will be displayed. Click on a new theme to select it. 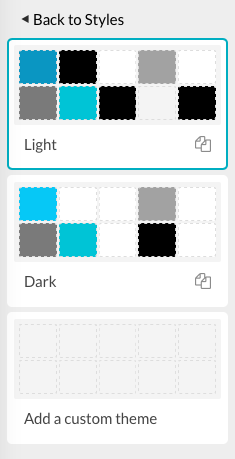 When you edit a theme, any of the style changes will be applied to any existing in-page experiences that the theme has been applied to unless a specific styling setting was changed in the experience. For example, a corporate theme is created, Corporate Theme, and the overlay text color is set to red. A new in-page experience is created and the overlay text color is changed to blue. If someone applies the Corporate Theme to this new experience, all of the style changes will be replaced with the styles specified in the Corporate Theme except the overlay text color as that style was changed earlier. Note: Built-in themes cannot be edited. Click the edit icon ( ) for the theme you want to edit. Click the duplicate icon ( ) for the theme you want to duplicate. 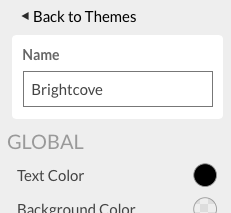 Enter a new name for the theme and click Save. Note: Built-in themes cannot be deleted. Click the delete icon ( ) for the theme you want to delete. You will be prompted to confirm the deletion.